Life becomes pared down. It loses its sense of richness. This as a painful, the absence of joy. My sense of hope is sketchy because I don’t know how long the dreariness is going to last. Is it a weekend visitor? Or, has it signed on for a month-to-month lease? I use the skills and tools I’ve harnessed over the years to cope with it. 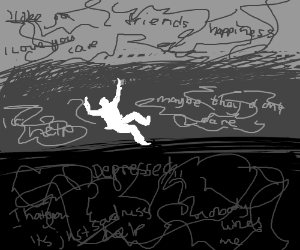 More or less, they work: the depression doesn’t last as long and isn’t as deep. I count that as a success. Sometimes, if I’m lucky, I head it off at the pass and it doesn’t take hold. But when I slip back into the tar pit of depression, I find myself thinking over and over again: how am I going to get out of this? I sense a loss of control. Depression is behind the wheel and I’m along for the ride. But there’s a happy ending. Because my depression always comes to an end. And yours will, too. I just wanted to say that I am always trying to find a post or blog about depression or mental illness that I can relate to. Your blog is the closest I’ve ever come to identifying with someone about depression. I hope that you continue to write or decide to reach out to me at mlzubik@gmail.com. I also really want to reach out to people through writing, but I also have social anxiety as well as depression, which isn’t an excuse, but unfortunately adds to my inability to reach out to other writers and people.